The cause is unknown but believed to involve genetics, immune system dysfunction, environmental exposures, and difficulties with the permeability of the skin. If one identical twin is affected, there is an 85% chance the other also has the condition. Those who live in cities and dry climates are more commonly affected. Exposure to certain chemicals or frequent hand washing makes symptoms worse. While emotional stress may make the symptoms worse it is not a cause. The disorder is not contagious. The diagnosis is typically based on the signs and symptoms. Other diseases that must be excluded before making a diagnosis include contact dermatitis, psoriasis, and seborrheic dermatitis. Treatment involves avoiding things that make the condition worse, daily bathing with application of a moisturising cream afterwards, applying steroid creams when flares occur, and medications to help with itchiness. Things that commonly make it worse include wool clothing, soaps, perfumes, chlorine, dust, and cigarette smoke. Phototherapy may be useful in some people. Steroid pills or creams based on calcineurin inhibitors may occasionally be used if other measures are not effective. Antibiotics (either by mouth or topically) may be needed if a bacterial infection develops. Dietary changes are only needed if food allergies are suspected. Atopic dermatitis affects about 20% of people at some point in their lives. It is more common in younger children. Males and females are equally affected. Many people outgrow the condition. Atopic dermatitis is sometimes called eczema, a term that also refers to a larger group of skin conditions. Other names include "infantile eczema", "flexural eczema", "prurigo Besnier", "allergic eczema", and "neurodermatitis". People with AD often have dry and scaly skin that spans the entire body, except perhaps the diaper area, and intensely itchy red, splotchy, raised lesions to form in the bends of the arms or legs, face, and neck. AD commonly occurs on the eyelids where signs such as Dennie-Morgan infraorbital fold, infra-auricular fissure, periorbital pigmentation can be seen. Post-inflammatory hyperpigmentation on the neck gives the classic 'dirty neck' appearance. Lichenification, excoriation and erosion or crusting on the trunk may indicate secondary infection. Flexural distribution with ill-defined edges with or without hyperlinearily on the wrist, finger knuckles, ankle, feet and hand are also commonly seen. The cause of AD is not known, although there is some evidence of genetic, environmental, and immunologic factors. Many people with AD have a family history of atopy. Atopy is an immediate-onset allergic reaction (type 1 hypersensitivity reaction) that manifests as asthma, food allergies, AD or hay fever. About 30% of people with atopic dermatitis have mutations in the gene for the production of filaggrin (FLG), which increase the risk for early onset of atopic dermatitis and developing asthma. According to the hygiene hypothesis, when children are brought up exposed to allergens in the environment at a young age, their immune system is more likely to tolerate them, while children brought up in a modern "sanitary" environment are less likely to be exposed to those allergens at a young age, and, when they are finally exposed, develop allergies. There is some support for this hypothesis with respect to AD. Those exposed to dogs while growing up have a lower risk of atopic dermatitis. There is also support from epidemiological studies for a protective role for helminths against AD. Likewise children with poor hygiene are at a lower risk for developing AD, as are children who drink unpasteurised milk. In a small percentage of cases, atopic dermatitis is caused by sensitization to foods. Also, exposure to allergens, either from food or the environment, can exacerbate existing atopic dermatitis. Exposure to dust mites, for example, is believed to contribute to one's risk of developing AD. A diet high in fruits seems to have a protective effect against AD, whereas the opposite seems true for fast foods. Atopic dermatitis sometimes appears associated with celiac disease and non-celiac gluten sensitivity, and the improvement with a gluten-free diet indicates that gluten is a causative agent in these cases. Colonization of the skin by the bacterium S. aureus is extremely prevalent in those with atopic dermatitis. Studies have found that abnormalities in the skin barrier of persons with AD are exploited by S. aureus to trigger cytokine expression, thus aggravating the condition. Atopic dermatitis in children may be linked to the level of calcium carbonate or "hardness" of household water, when used to drink. So far these findings have been supported in children from the United Kingdom, Spain, and Japan. The pathophysiology may involve a mixture of type I and type IV-like hypersensitivity reactions. Atopic dermatitis is typically diagnosed clinically, meaning it is diagnosed based on signs and symptoms alone, without special testing. Several different forms of criteria developed for research have also been validated to aid in diagnosis. Of these, the UK Diagnostic Criteria, based on the work of Hanifin and Rajka, has been the most widely validated. There is no known cure for AD, although treatments may reduce the severity and frequency of flares. Applying moisturisers may prevent the skin from drying out and decrease the need for other medications. Affected persons often report that improvement of skin hydration parallels with improvement in AD symptoms. Health professionals often recommend that persons with AD bathe regularly in lukewarm baths, especially in salt water, to moisten their skin. Avoiding woollen clothing is usually good for those with AD. Likewise silk, silver-coated clothing may help. Dilute bleach baths have also been reported effective at managing AD. The role of vitamin D on atopic dermatitis is not clear, but there is some evidence that vitamin D supplementation may improve its symptoms. Studies have investigated the role of long chain polyunsaturated fatty acids (LCPUFA) supplementation and LCPUFA status in the prevention and treatment of atopic diseases, but the results are controversial. It remains unclear if the nutritional intake of n-3 fatty acids has a clear preventive or therapeutic role, or if n-6 fatty acids consumption promotes atopic diseases. Several probiotics seem to have a positive effect with a roughly 20% reduction in the rate of atopic dermatitis. The best evidence is for multiple strains of bacteria. In people with celiac disease or non-celiac gluten sensitivity, a gluten free diet improves their symptoms and prevents the occurrence of new outbreaks. Topical corticosteroids, such as hydrocortisone, have proven effective in managing AD. If topical corticosteroids and moisturisers fail, short-term treatment with topical calcineurin inhibitors like tacrolimus or pimecrolimus may be tried, although their use is controversial as some studies indicate that they increase the risk of developing skin cancer or lymphoma. A 2007 meta-analysis showed that topical pimecrolimus is not as effective than corticosteroids and tacrolimus. However a 2015 meta-analysis indicated that topical tacrolimus and picrolemus are more effective than low dose topical corticosteroids, and found no evidence for increased risk of malignancy or skin atrophy. Other alternatives include systemic immunosuppressants such as ciclosporin, methotrexate, interferon gamma-1b, mycophenolate mofetil and azathioprine. Antidepressants and naltrexone may be used to control pruritus (itchiness). In 2016, crisaborole was approved as a topical treatment for mild-to-moderate eczema. In 2017, the biologic agent dupilumab was approved to treat moderate-to-severe eczema. There is tentative evidence that allergy immunotherapy is effective in atopic dermatitis, but the quality of the evidence is low. This treatment consists of a series of injections or drops under the tongue of a solution containing the allergen. Antibiotics, either by mouth or applied topically, is commonly used to target overgrowth of Staphylococcus aureus in the skin of people with atopic dermatitis. However, a 2008 meta-analysis found no clear evidence of benefit. A more novel form of treatment involves exposure to broad or narrow-band ultraviolet (UV) light. UV radiation exposure has been found to have a localized immunomodulatory effect on affected tissues and may be used to decrease the severity and frequency of flares. In particular, the usage of UVA1 is more effective in treating acute flares, whereas narrow-band UVB is more effective in long-term management scenarios. However, UV radiation has also been implicated in various types of skin cancer, and thus UV treatment is not without risk. While there are several Chinese herbal medicines intended for treating atopic eczema, there is no conclusive evidence that these treatments, taken by mouth or applied topically, reduce the severity of eczema in children or adults. 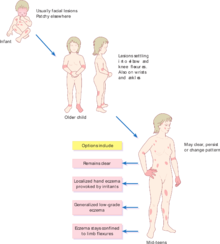 Since the beginning of the twentieth century, many mucosal inflammatory disorders have become more common; atopic eczema (AE) is a classic example of such a disease. It now affects 15–30% of children and 2–10% of adults in developed countries and in the United States has nearly tripled in the past thirty to forty years. Over 15 million American adults and children have atopic dermatitis. Evidence suggests that IL-4 is central in the pathogenesis of AD. Therefore, there is a rationale for targeting IL-4 with anti-IL-4 inhibitors. People with atopic dermatitis are more likely to have Staphylococcus aureus living on them. The role this plays in pathogenesis is yet to be determined. ^ a b Williams, Hywel C. (2000). The epidemiology of atopic dermatitis. New York: Cambridge University Press. p. 10. ISBN 9780521570756. Archived from the original on 2015-06-19. ^ a b c d e f g h i j k l m n o p q r s t u v w x y "Handout on Health: Atopic Dermatitis (A type of eczema)". National Institute of Arthritis and Musculoskeletal and Skin Diseases. May 2013. Archived from the original on 30 May 2015. Retrieved 19 June 2015. ^ a b c d e f g h i j k l m n o p Tollefson MM, Bruckner AL (December 2014). "Atopic dermatitis: skin-directed management". Pediatrics. 134 (6): e1735–44. doi:10.1542/peds.2014-2812. PMID 25422009. ^ a b Thomsen SF (2014). "Atopic dermatitis: natural history, diagnosis, and treatment". ISRN Allergy. 2014: 354250. doi:10.1155/2014/354250. PMC 4004110. PMID 25006501. ^ Williams, Hywel (2009). Evidence-Based Dermatology. John Wiley & Sons. p. 128. ISBN 9781444300178. Archived from the original on 2017-09-08. ^ Carr WW (August 2013). "Topical calcineurin inhibitors for atopic dermatitis: review and treatment recommendations". Paediatric Drugs. 15 (4): 303–10. doi:10.1007/s40272-013-0013-9. PMC 3715696. PMID 23549982. ^ a b c d e f g Berke R, Singh A, Guralnick M (July 2012). "Atopic dermatitis: an overview" (PDF). American Family Physician. 86 (1): 35–42. PMID 22962911. Archived (PDF) from the original on 2015-09-06. ^ a b c d e Kim, BS (21 January 2014). Fritsch, P; Vinson, RP; Perry, V; Quirk, CM; James, WD (eds.). "Atopic Dermatitis". Medscape Reference. WebMD. Archived from the original on 10 February 2014. Retrieved 3 March 2014. ^ Brehler, R (2009). "Atopic Dermatitis". In Lang, F (ed.). Encyclopedia of molecular mechanisms of diseases. Berlin: Springer. ISBN 978-3-540-67136-7. ^ Baron SE, Cohen SN, Archer CB (May 2012). "Guidance on the diagnosis and clinical management of atopic eczema". Clinical and Experimental Dermatology. 37 Suppl 1: 7–12. doi:10.1111/j.1365-2230.2012.04336.x. PMID 22486763. ^ Schmitt J, Langan S, Deckert S, Svensson A, von Kobyletzki L, Thomas K, Spuls P (December 2013). "Assessment of clinical signs of atopic dermatitis: a systematic review and recommendation". The Journal of Allergy and Clinical Immunology. 132 (6): 1337–47. doi:10.1016/j.jaci.2013.07.008. PMID 24035157. ^ Kwatra, Shawn G.; Tey, Hong Liang; Ali, Saba M.; Dabade, Tushar; Chan, Yiong-Huak; Yosipovitch, Gil (2012). "The infra-auricular fissure: A bedside marker of disease severity in patients with atopic dermatitis - Journal of the American Academy of Dermatology". Journal of the American Academy of Dermatology. 66 (6): 1009–1010. doi:10.1016/j.jaad.2011.10.031. PMID 22583715. Retrieved 2016-03-20. ^ Lau, Chu-Pak (2006-01-01). Problem-Based Medical Case Management. Hong Kong University Press. ISBN 9789622097759. Archived from the original on 2016-04-01. ^ Grey K, Maguiness S (August 2016). "Atopic Dermatitis: Update for Pediatricians". Pediatric Annals (Review). 45 (8): e280–6. doi:10.3928/19382359-20160720-05. PMID 27517355. ^ Park KD, Pak SC, Park KK (December 2016). "The Pathogenetic Effect of Natural and Bacterial Toxins on Atopic Dermatitis". Toxins (Review). 9 (1): 3. doi:10.3390/toxins9010003. PMC 5299398. PMID 28025545. ^ Irvine AD, McLean WH, Leung DY (October 2011). "Filaggrin mutations associated with skin and allergic diseases". The New England Journal of Medicine (Review). 365 (14): 1315–27. doi:10.1056/NEJMra1011040. PMID 21991953. ^ Bieber T (April 2008). "Atopic dermatitis". The New England Journal of Medicine. 358 (14): 1483–94. doi:10.1056/NEJMra074081. PMID 18385500. ^ Pelucchi C, Galeone C, Bach JF, La Vecchia C, Chatenoud L (September 2013). "Pet exposure and risk of atopic dermatitis at the pediatric age: a meta-analysis of birth cohort studies". The Journal of Allergy and Clinical Immunology. 132 (3): 616–622.e7. doi:10.1016/j.jaci.2013.04.009. PMID 23711545. ^ a b c Flohr C, Mann J (January 2014). "New insights into the epidemiology of childhood atopic dermatitis". Allergy. 69 (1): 3–16. doi:10.1111/all.12270. PMID 24417229. ^ di Mauro G, Bernardini R, Barberi S, Capuano A, Correra A, De' Angelis GL, Iacono ID, de Martino M, Ghiglioni D, Di Mauro D, Giovannini M, Landi M, Marseglia GL, Martelli A, Miniello VL, Peroni D, Sullo LR, Terracciano L, Vascone C, Verduci E, Verga MC, Chiappini E (2016). "Prevention of food and airway allergy: consensus of the Italian Society of Preventive and Social Paediatrics, the Italian Society of Paediatric Allergy and Immunology, and Italian Society of Pediatrics". The World Allergy Organization Journal (Review). 9: 28. doi:10.1186/s40413-016-0111-6. PMC 4989298. PMID 27583103. ^ Williams H, Flohr C (July 2006). "How epidemiology has challenged 3 prevailing concepts about atopic dermatitis" (PDF). The Journal of Allergy and Clinical Immunology. 118 (1): 209–13. doi:10.1016/j.jaci.2006.04.043. PMID 16815157. ^ Fuiano N, Incorvaia C (June 2012). "Dissecting the causes of atopic dermatitis in children: less foods, more mites". Allergology International. 61 (2): 231–43. doi:10.2332/allergolint.11-RA-0371. PMID 22361514. ^ a b Mansueto P, Seidita A, D'Alcamo A, Carroccio A (2014). "Non-celiac gluten sensitivity: literature review". Journal of the American College of Nutrition (Review). 33 (1): 39–54. doi:10.1080/07315724.2014.869996. hdl:10447/90208. PMID 24533607. ^ Goh CL, Wong JS, Giam YC (September 1997). "Skin colonization of Staphylococcus aureus in atopic dermatitis patients seen at the National Skin Centre, Singapore". International Journal of Dermatology. 36 (9): 653–7. doi:10.1046/j.1365-4362.1997.00290.x. PMID 9352404. ^ a b Sengupta P (August 2013). "Potential health impacts of hard water". International Journal of Preventive Medicine (Review). 4 (8): 866–75. PMC 3775162. PMID 24049611. ^ "Medscape Log In". www.medscape.com. Archived from the original on 2016-08-29. Retrieved 2017-04-16. ^ Eichenfield LF, Tom WL, Chamlin SL, Feldman SR, Hanifin JM, Simpson EL, Berger TG, Bergman JN, Cohen DE, Cooper KD, Cordoro KM, Davis DM, Krol A, Margolis DJ, Paller AS, Schwarzenberger K, Silverman RA, Williams HC, Elmets CA, Block J, Harrod CG, Smith Begolka W, Sidbury R (February 2014). "Guidelines of care for the management of atopic dermatitis: section 1. Diagnosis and assessment of atopic dermatitis". Journal of the American Academy of Dermatology. 70 (2): 338–51. doi:10.1016/j.jaad.2013.10.010. PMC 4410183. PMID 24290431. ^ a b Brenninkmeijer EE, Schram ME, Leeflang MM, Bos JD, Spuls PI (April 2008). "Diagnostic criteria for atopic dermatitis: a systematic review". The British Journal of Dermatology. 158 (4): 754–65. doi:10.1111/j.1365-2133.2007.08412.x. PMID 18241277. ^ a b Williams HC, Burney PG, Pembroke AC, Hay RJ (September 1994). "The U.K. Working Party's Diagnostic Criteria for Atopic Dermatitis. III. Independent hospital validation". The British Journal of Dermatology. 131 (3): 406–16. doi:10.1111/j.1365-2133.1994.tb08532.x. PMID 7918017. ^ Varothai S, Nitayavardhana S, Kulthanan K (June 2013). "Moisturizers for patients with atopic dermatitis". Asian Pacific Journal of Allergy and Immunology. 31 (2): 91–8. PMID 23859407. Archived from the original (PDF) on 2015-04-02. Retrieved 2014-03-03. ^ a b c Lio PA (October 2013). "Non-pharmacologic therapies for atopic dermatitis". Current Allergy and Asthma Reports. 13 (5): 528–38. doi:10.1007/s11882-013-0371-y. PMID 23881511. ^ Dębińska A, Sikorska-Szaflik H, Urbanik M, Boznański A (2015). "The role of vitamin D in atopic dermatitis". Dermatitis (Review). 26 (4): 155–61. doi:10.1097/DER.0000000000000128. PMID 26172483. ^ Kim G, Bae JH (September 2016). "Vitamin D and atopic dermatitis: A systematic review and meta-analysis". Nutrition (Systematic Review and Meta-Analysis). 32 (9): 913–20. doi:10.1016/j.nut.2016.01.023. PMID 27061361. ^ Ashcroft DM, Chen LC, Garside R, Stein K, Williams HC (October 2007). "Topical pimecrolimus for eczema". The Cochrane Database of Systematic Reviews (4): CD005500. doi:10.1002/14651858.CD005500.pub2. PMID 17943859. ^ Cury Martins J, Martins C, Aoki V, Gois AF, Ishii HA, da Silva EM (July 2015). "Topical tacrolimus for atopic dermatitis". The Cochrane Database of Systematic Reviews (7): CD009864. doi:10.1002/14651858.CD009864.pub2. PMID 26132597. ^ Yarbrough KB, Neuhaus KJ, Simpson EL (March–April 2013). "The effects of treatment on itch in atopic dermatitis". Dermatologic Therapy. 26 (2): 110–9. doi:10.1111/dth.12032. PMC 4524501. PMID 23551368. ^ Kim K (November 2012). "Neuroimmunological mechanism of pruritus in atopic dermatitis focused on the role of serotonin". Biomolecules & Therapeutics. 20 (6): 506–12. doi:10.4062/biomolther.2012.20.6.506. PMC 3762292. PMID 24009842. ^ "FDA Approves Eucrisa for Eczema". U.S. Food and Drug Administration. 14 December 2016. ^ "Eucrisa (crisaborole) Ointment, 2%, for Topical Use. Full Prescribing Information". Anacor Pharmaceuticals, Inc. Palo Alto, CA 94303 USA. Retrieved 17 December 2016. ^ "FDA approves new eczema drug Dupixent". US Food & Drug Administration. 28 March 2017. Archived from the original on 28 March 2017. Retrieved 29 March 2017. ^ a b Tam H, Calderon MA, Manikam L, Nankervis H, García Núñez I, Williams HC, Durham S, Boyle RJ (February 2016). "Specific allergen immunotherapy for the treatment of atopic eczema". The Cochrane Database of Systematic Reviews. 2: CD008774. doi:10.1002/14651858.CD008774.pub2. hdl:10044/1/31818. PMID 26871981. ^ Birnie AJ, Bath-Hextall FJ, Ravenscroft JC, Williams HC (July 2008). "Interventions to reduce Staphylococcus aureus in the management of atopic eczema". The Cochrane Database of Systematic Reviews (3): CD003871. doi:10.1002/14651858.CD003871.pub2. PMID 18646096. ^ Tintle S, Shemer A, Suárez-Fariñas M, Fujita H, Gilleaudeau P, Sullivan-Whalen M, Johnson-Huang L, Chiricozzi A, Cardinale I, Duan S, Bowcock A, Krueger JG, Guttman-Yassky E (September 2011). "Reversal of atopic dermatitis with narrow-band UVB phototherapy and biomarkers for therapeutic response". The Journal of Allergy and Clinical Immunology. 128 (3): 583–93.e1–4. doi:10.1016/j.jaci.2011.05.042. PMC 3448950. PMID 21762976. ^ Beattie PE, Finlan LE, Kernohan NM, Thomson G, Hupp TR, Ibbotson SH (May 2005). "The effect of ultraviolet (UV) A1, UVB and solar-simulated radiation on p53 activation and p21". The British Journal of Dermatology. 152 (5): 1001–8. doi:10.1111/j.1365-2133.2005.06557.x. PMID 15888160. ^ Meduri NB, Vandergriff T, Rasmussen H, Jacobe H (August 2007). "Phototherapy in the management of atopic dermatitis: a systematic review". Photodermatology, Photoimmunology & Photomedicine. 23 (4): 106–12. doi:10.1111/j.1600-0781.2007.00291.x. PMID 17598862. ^ Jans J, Garinis GA, Schul W, van Oudenaren A, Moorhouse M, Smid M, Sert YG, van der Velde A, Rijksen Y, de Gruijl FR, van der Spek PJ, Yasui A, Hoeijmakers JH, Leenen PJ, van der Horst GT (November 2006). "Differential role of basal keratinocytes in UV-induced immunosuppression and skin cancer". Molecular and Cellular Biology. 26 (22): 8515–26. doi:10.1128/MCB.00807-06. PMC 1636796. PMID 16966369. ^ Gu S, Yang AW, Xue CC, Li CG, Pang C, Zhang W, Williams HC (September 2013). "Chinese herbal medicine for atopic eczema". The Cochrane Database of Systematic Reviews (9): CD008642. doi:10.1002/14651858.CD008642.pub2. PMID 24018636. ^ Saito H (August 2005). "Much atopy about the skin: genome-wide molecular analysis of atopic eczema". International Archives of Allergy and Immunology. 137 (4): 319–25. doi:10.1159/000086464. PMID 15970641. ^ "Atopic Dermatitis". www.uchospitals.edu. 1 January 2015. Archived from the original on 2015-04-08. Retrieved 2 April 2015. ^ Bao L, Shi VY, Chan LS (February 2013). "IL-4 up-regulates epidermal chemotactic, angiogenic, and pro-inflammatory genes and down-regulates antimicrobial genes in vivo and in vitro: relevant in the pathogenesis of atopic dermatitis". Cytokine. 61 (2): 419–25. doi:10.1016/j.cyto.2012.10.031. PMID 23207180. ^ Di Lernia V (January 2015). "Therapeutic strategies in extrinsic atopic dermatitis: focus on inhibition of IL-4 as a new pharmacological approach". Expert Opinion on Therapeutic Targets. 19 (1): 87–96. doi:10.1517/14728222.2014.965682. PMID 25283256. ^ Totté JE, van der Feltz WT, Hennekam M, van Belkum A, van Zuuren EJ, Pasmans SG (October 2016). "Prevalence and odds of Staphylococcus aureus carriage in atopic dermatitis: a systematic review and meta-analysis". The British Journal of Dermatology. 175 (4): 687–95. doi:10.1111/bjd.14566. PMID 26994362. Wikimedia Commons has media related to Atopic dermatitis.